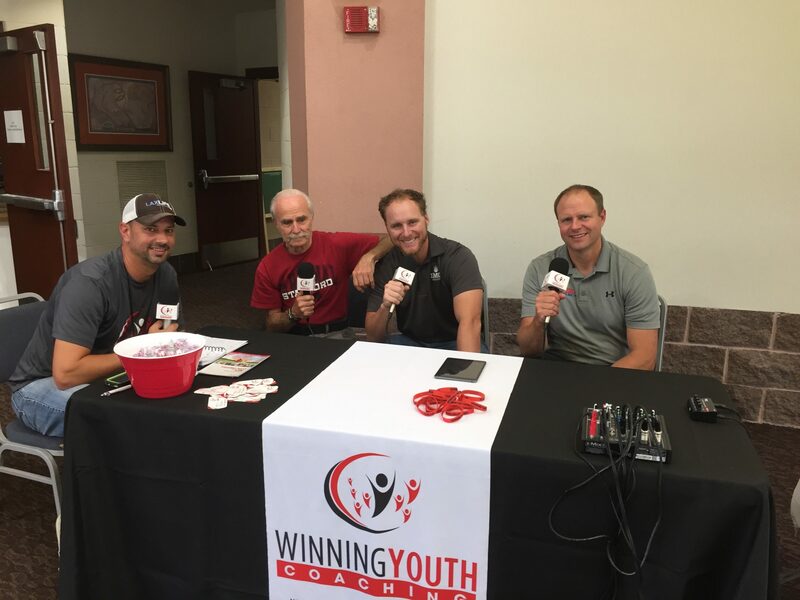 Today’s episode is a bit different from the norm, instead of interviewing a great coach, this week’s episode is a compilation of the interviews I did while at the conference. There are a few sound bites with me sharing a lesson I learned, and definitely don’t miss the 18 minute interview with the leaders – I call them the 3 J’s – Dr. Jerry Lynch, John O’Sullivan, and James Leath. So hopefully this is a great way for you to be able to absorb a little of the great content even if you weren’t able to make it out to Colorado. 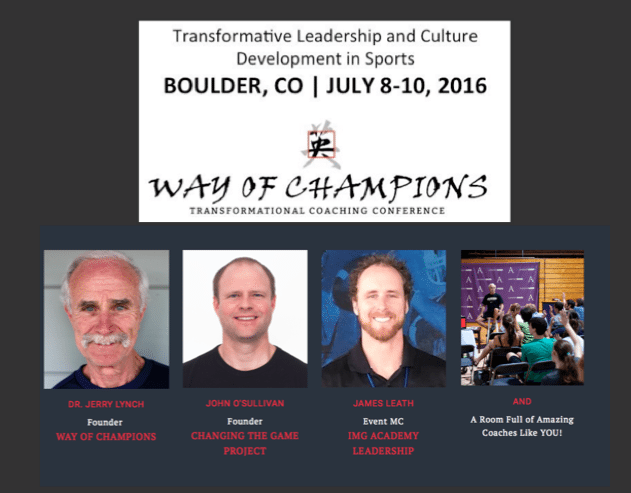 Also – just FYI – they are planning to do 2 or 3 more of these conferences around the country next year, so stay tuned at changingthegameproject.com or wayofchampions.com. Many of you know that I work closely with John O’Sullivan and the Changing the Game Project. John’s is an internationally known writer and speaker, as well as a former professional soccer player and longtime coach. We share a lot of each others content as we work to transform youth sports and make it a better place for coaches to coach, and for players to play. This week – for the first and only time in 2016 – John is releasing his amazing online video series called “Coaching Mastery.” He first ran this course in the Fall of 2014, and since then coaches from nearly every sport, from over a dozen different continents, have called it one of the most unique and inspirational coaching courses they had ever done. I was lucky enough to be one of the select few coaches John offered it to last year, and the things I learned really blew me away. See, this course is not your traditional X’s and O’s course. 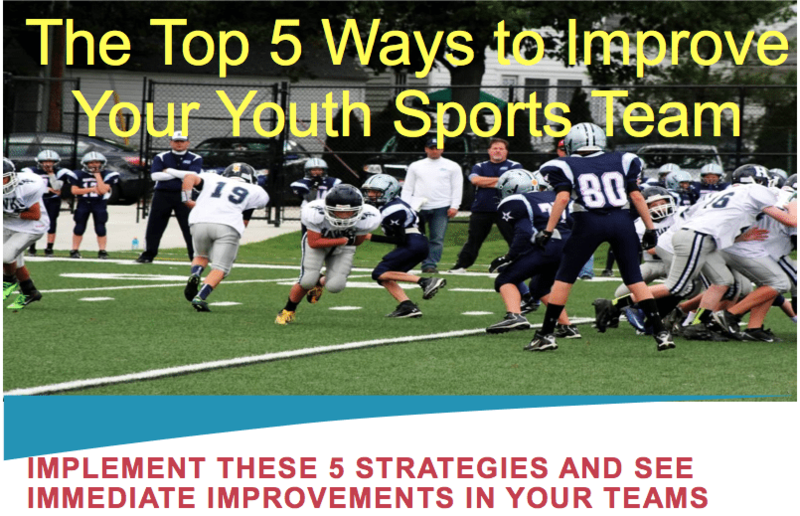 It is all about things such as the psychology of performance and leadership, how to build a winning team culture, and even how to educate your team parents so they don’t drive you up the wall. He has some amazing interviews with some of the world’s leading experts in sport science and psychology, coaching, and leadership. The things you will learn in this course will take yoru coaching, and your teams, to a whole new level. This course is truly one of a kind. I know I am looking forward to the 2016 version of Coaching Mastery and I am confident that many of you will get a ton from this free video series. Its all new content, and I can’t wait to get started. Again, if you want to join, just sign up here. I look forward to hearing your thoughts on this course. Craig – 11 attributes of culture: Dr. Jerry Lynch uses the acronym STRONG FACTS to list the steps to build championship culture. Interview with Josh Severns – From Nashville FC Youth Soccer – Building culture is a process not an event. Trust takes time to build. It start with being a good example; Meditation and breathing. This entry was posted in Podcasts and tagged in Aspen Institute, athlete, baseball, basketball, building culture, championship culture, Changing the Game Project, changingthegameproject.com, changingthegameproject.com/wocconference, cheerleading, coach, Coaching, coaching mastery, coaching podcast, coaching your own child, coaching your own kid, coaching youth, coaching youth sports, culture, dad, dad coach, daughter, destination unstoppable, Dr. Jerry Lynch, ESPN, football, gymnastics, hockey, IMG Academy, James Leath, John O’Sullivan, lacrosse, leadership, Maureen monte, mental toughness, mental toughness kids, mlb, mom, mom coach, Nashville FC Youth Soccer, national alliance youth sports, nays, NBA, NFL, Parenting, pca, peak performance, podcast, podcasts, positive coaching, Positive Coaching Alliance, positive culture, Project Play, soccer, softball, son, sports, sports podcast, sports psychology, sports specialization, swimming, TEDx, volleyball, Way of Champions, wayofchampions.com, winning, Winning Youth Coaching, Winning Youth Football, youth, youth coaching, youth sports, youth sports podcast.